When I first met Jay, we were carefree college students: He was a fraternity guy and ultimate frisbee player studying to be an engineer. I was an English major and a sorority girl who worked at the school newspaper. Between the two of us, I was often the one who was anxious or worried, constantly chasing a deadline for feature stories for the paper or essays for class. Jay, on the other hand, was the laid back one, perhaps the least stressed person I knew in college. No paper or test or deadline could rattle him (it helps that he is one of the smartest people I know). He always knew how to help me relax when I was feeling overwhelmed. Fast forward 11 years: Now we have a mortgage, a dog and a new baby, and we’re both grappling with the pressures that come with balancing the roles of provider and parent. I’ve watched how fatherhood, and the great responsibility it entails, weighs on my husband. For the first time the guy who never used to worry has … worries. And with good reason: there is a lot to worry about when you step into this role, to start, just making sure you keep your baby alive. Then there is the inevitable, “Am I doing this right?” worry that accompanies parenting. There are a million and one ways to sleep train, and not enough evidence-based research to point to one right way, Jay pointed out the other day. The amount of resources and books and blogs is daunting. Let’s not forget the challenging and confusing societal expectations around fatherhood in America. When I talked with Jay about the way women take on mental load of parenthood, he agreed and added that he thinks there are other mental burdens dads traditionally take on as well, especially when it comes to plans for household finances and yard work. While we’re committed to forging a more egalitarian marriage than prior generations, we inevitably fall into some gendered divisions of labor (mental and physical), but we’re aware of it and trying to do what works best for our family. Regardless of how you split it up, parenting is a lot of work, and it’s emotionally and physically taxing. He probably wouldn’t say it but I’m so proud of how my husband has handled the new heft of fatherhood with so much grace. And even though there are more pressures and more worries, Jay’s still the one that helps me relax at the end of the day. After our son’s dramatic entry into the world, I was emotionally traumatized and physically drained. I needed more support than ever from Jay and at the same time we both had a new focus–a little one that needed all our support. 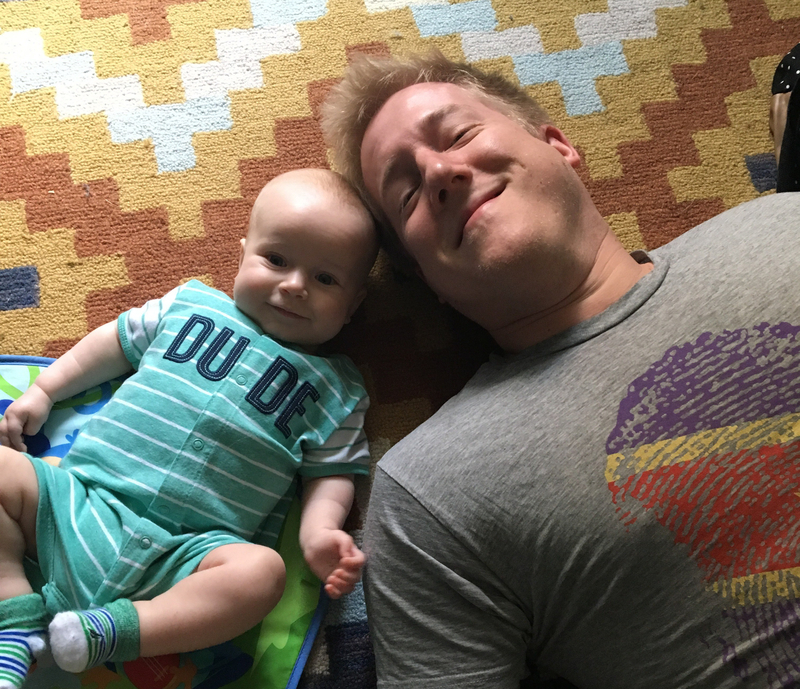 Even though we were separated from Jack on those early days–he was floors away in the NICU–nothing would stop me from my quest to breastfeed our son. And Jay joined me in that quest. At all hours of the day, Jay would help me into my wheelchair and we’d make the 15-minute multi-elevator trip to see Jack. When we got there, my husband would help lift Jack into my arms because I was still too weak to do so and encourage me when I got discouraged if Jack didn’t latch. Those trips back and forth to see Jack were full of laughter and tears and heartfelt conversation about our new son. We were both in awe of Jack and frustrated by how hard breastfeeding was (it hurts, it’s awkward and you have to do it all the time when babies are very little). It is thanks to Jay that I was able to persevere and pull off breastfeeding Jack after my C-section and Jack’s stint in the NICU. What I didn’t know until later that week was that the whole time I was suffering, Jay was too–he had been nursing a cold and foot pain–but he never once complained. Instead he accompanied me through my pain and held me when I needed it, because that’s what fatherhood required of him in the moment. When he’d admitted this to me later that week, after Jack was out of the NICU, I asked him to go home and take care of himself, to shower, take a nap and get the medicine he needed. This dance of caring for each other and Jack and caring for ourselves has continued since we took Jack home. We are more open and honest with our aches and pains (emotional and physical) than ever before–and we each take turns being one another’s caretaker. There’s no shortage of articles online about the ways becoming parents can put stress on a marriage. And there’s no question that it does. But I count myself as lucky because parenting has only brought us closer together. Our secret? It’s a willingness to be vulnerable with each other and accept help when it is offered. He lifts me up when I am weak, and I do the same for him. When we first got our puppy Gus, my husband took a short puppy paternity leave to feed, nurture and potty-train him. As such, the two have built up this incredible bond and are often inseparable at home. This sometimes made me feel left out but I realized that this doesn’t make my dog love me any less, Jay is simply his primary parent. We found other ways to bond and build up our relationship, and I just love how Gus brings so much joy to our lives. Now that Jack’s in the picture the tables have turned and I am his primary parent. I know that this sometimes means my husband can feel left out and I see the pain this causes him. I think it’s especially hard because our son is so little and can’t do a lot so it’s harder for Jay to bond with him. On the other hand, the bond I share with my son from carrying him in the womb and breastfeeding him is very strong. A father can’t compete and shouldn’t–and I know Jay is building a different sort of bond with Jack just as I have with our dog. Speaking of being left out: Dads don’t always get included in the baby showers or celebrations when new babies come in. I actually think that’s kind of a shame. I think we should change that. Babies are a life-altering, joyous gift and although fathers don’t carry babies in their bodies, they certainly carry them in their hearts. Why can’t we start including dads more in these celebrations? We should include them because creating a family is a very special gift. I also know from Jay that our little family has brought new meaning to his life, a wholeness, a completeness that comes from being a family of four (yes, we include our dog, we firmly believe dogs are part of the family too!). I’ve seen how fatherhood has given Jay a new sense of purpose and delight. The love he has for Jack shines so bright, it is stunning. Whenever our friends ask us about parenthood, these three words come up: hard, rewarding and fun! Having a little one is an incredible, life-altering adventure and there’s no one I’d rather do it with than Jay. Here’s the best part: Each year as we age and grow, I love Jay even more deeply than before, from boyfriend to husband to father. Jay, even though we keep saying this has been the hardest year yet, I’ll take all the hard moments for the small, sweet bursts of joy we’ve shared together as parents. I love you, babe. LOVED this post. Thank you for sharing for all those newly married and about to head into that chapter of our life.